**CONTEST CLOSED**This summer, there hasn’t been a movie more anticipated than Jurassic World. Ever wonder which dinosaurs roamed Arizona? Our state had a very different landscape 65 million years ago. Dinosaur life wasn’t as easy as the Jurassic Park franchise might lead you to believe. Now is your chance to learn all about them! 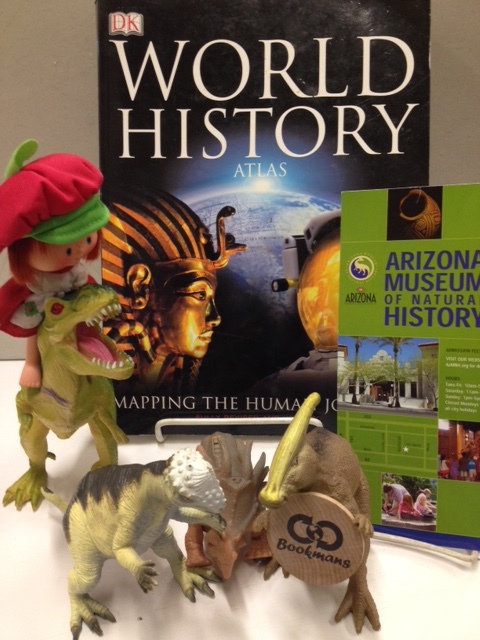 This Ticket Tuesday we give away an Arizona Museum of Natural History membership. We treasure our opportunities to partner with the Arizona Museum of Natural History (AZMNH). If we could, we’d give every man, woman and child membership to Arizona’s premier natural history museum. Thanks to their generosity, we’ll be one person closer to that dream. AZMNH is dedicated to inspire wonder, respect and understanding for the natural and cultural history of the Southwest. Mission accomplished! * Free admission to AZMNH for one year. * Invitations to opening receptions and special events. * 10% discount in the AZMNH store. Since I was a child I loved triceratops. She’s beautiful and graceful, but fierce when needed! Microraptor – because I love miniatures. Dino from The Flintstones is my favorite dinosaur. I would rather be lucked to death than eaten. Somebody already mentioned microraptor, but that’s also my favorite. Tiny, four winged dinosaur? What’s not to like? The T-Rex because it towers over us. I haven’t been to Arizona Mesuem of Natural History since a second grade field trip and so want to go back! Hi, Amy! We sent a message to your Yahoo address, please check your inbox. Thanks! Stegosaurus is clearly awesome because who doesn’t love a ready made Mohawk?! Spinosarus cause its fierce and the scariest looking with spines and a crocodile head.